Welcome to another Fed Wednesday. Let's review what took place on Tuesday, and then discuss what may take place after the Fed Decision (which is pretty much already baked in). 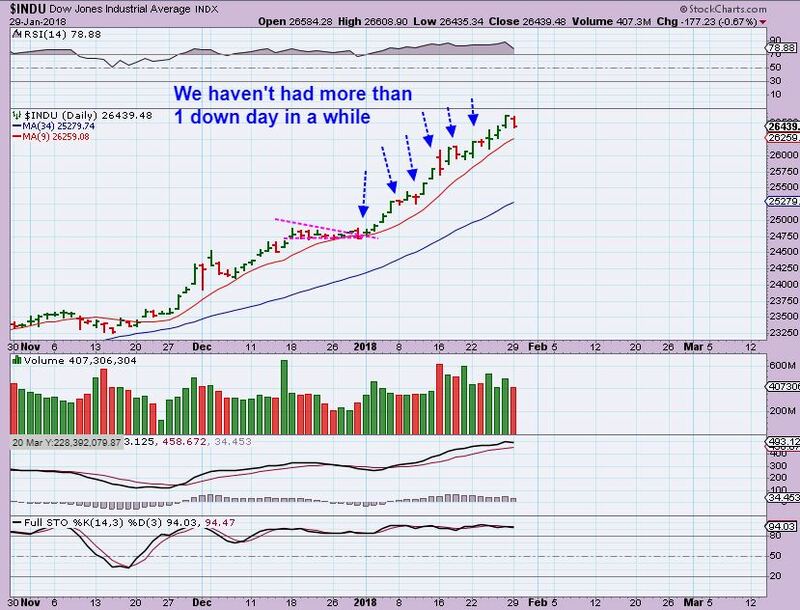 DJIA - Finally, 2 down days in a row and a close under the 10sma. The DOW has started a drop into a daily cycle low. https://chartfreak.com/wp-content/uploads/sites/18/2018/01/WHY.jpg 626 983 Alex - Chart Freak https://chartfreak.com/wp-content/uploads/sites/6/2013/04/black_logo.png Alex - Chart Freak2018-01-30 12:38:472018-01-30 12:38:47Jan 29- WHY? 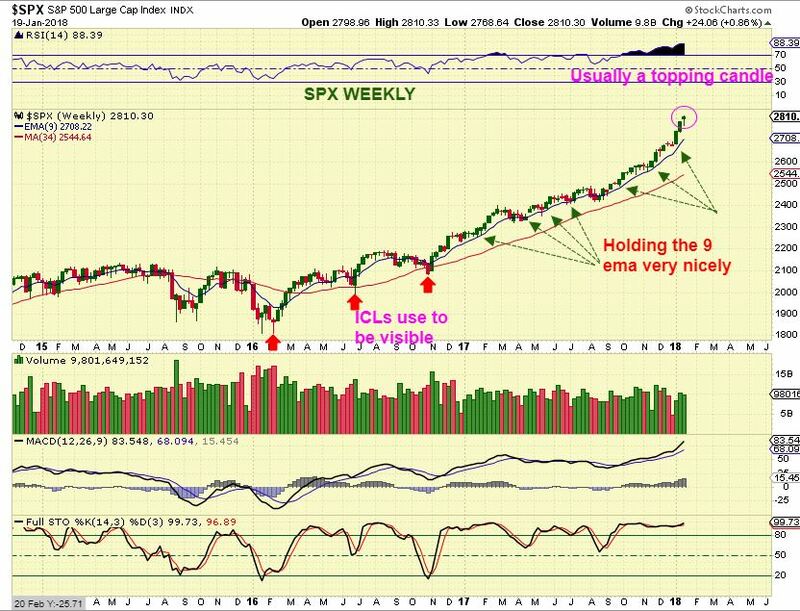 SPX WEEKLY #1 - As expected, the General Markets are accelerating and this weekly chart shows the last 4 weeks as strong green weeks. A trailing stop has been very effective for those riding this 'long'. 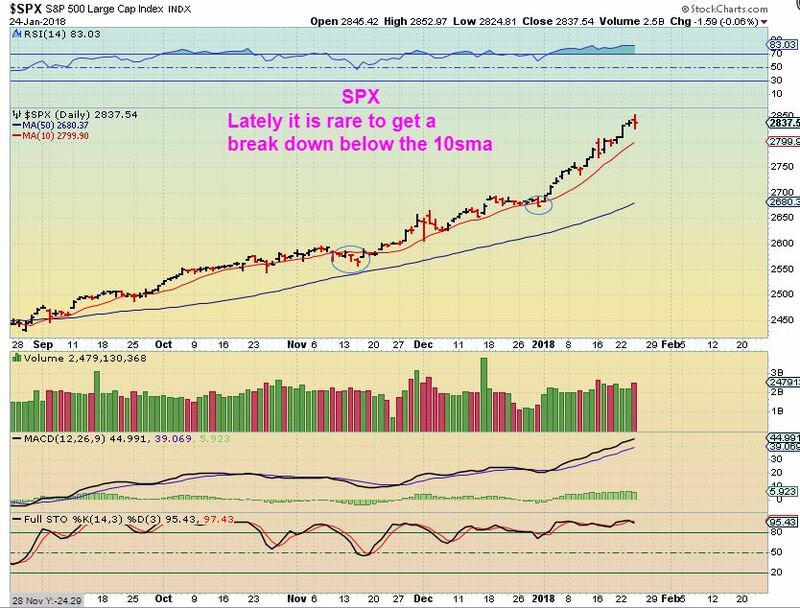 SPX - The General Markets continue higher, and the pull backs have hardly been below the 10sma. 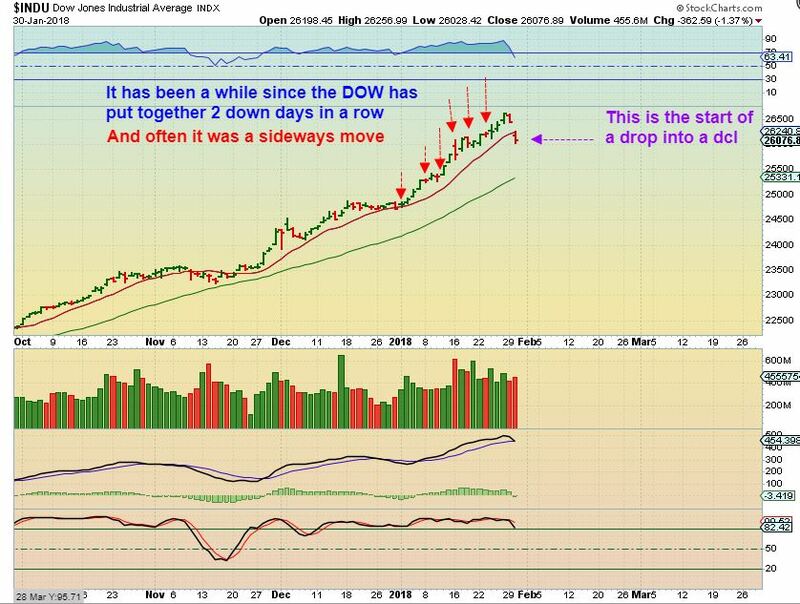 This is a doji candle and usually leads to a reversal top, we are due for a deeper drop, but as I have been saying for weeks and months now - just use a trailing stop and you can stay long in this type of bull run ( Some are in UPRO, UDOW, etc). 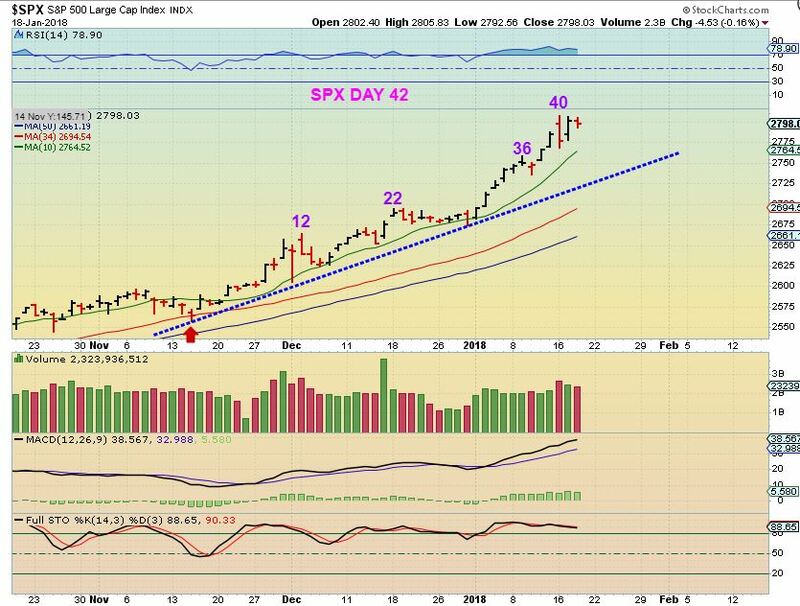 SPX - I believe this is day 44 of this daily cycle. 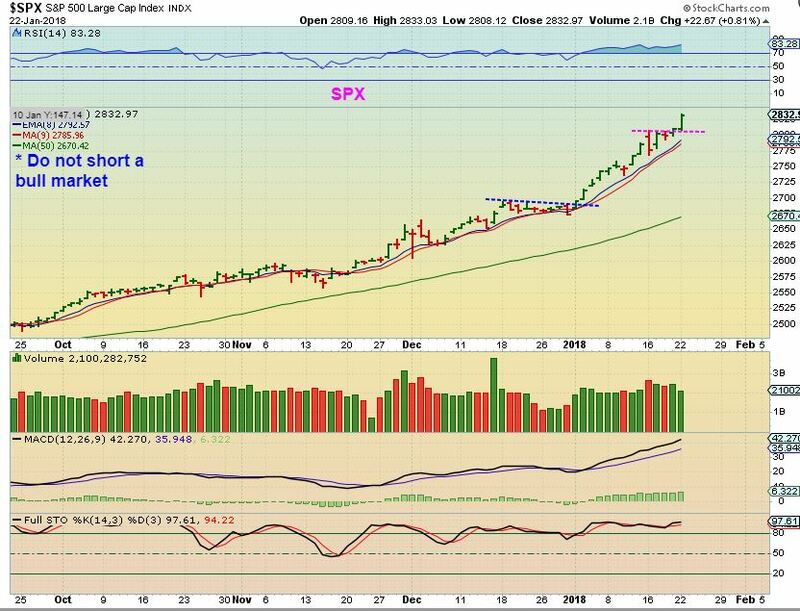 It looked like a bull flag going into the weekend, and it did break upward, but it is late in that daily cycle. I would expect a small pull back soon. 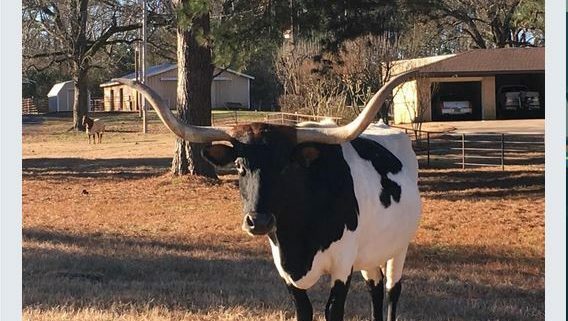 These are very bullish markets. 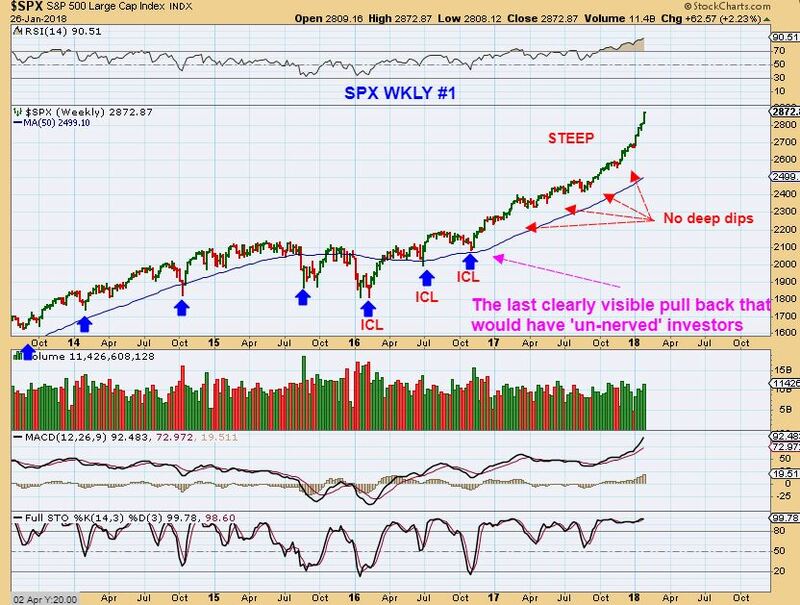 SPX - This is usually a topping candle, a 'spinning top' on the weekly. The markets have been very strong, so a pull back would be normal. We'll see how this plays out next week in our daily reports. DJIA - We just can't even get a 2 day pull back in this runaway move 🙂 A trailing stop still has you in this long position ( TQQQ, UPRO, UDOW, ETC). 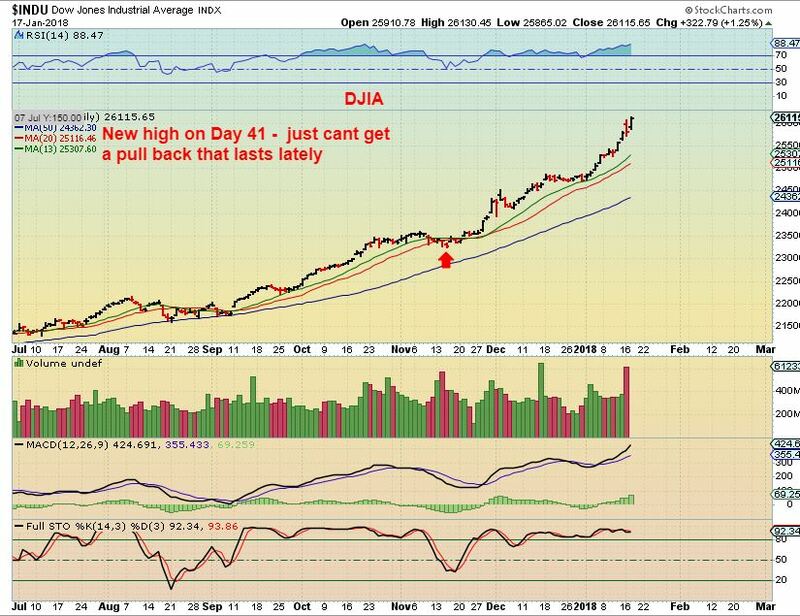 If we do get a sustained pull back, it will likely be a very good buying opportunity.Day 41 for the Dow is getting late.